Landry’s is an American multi-brand restaurant operator. 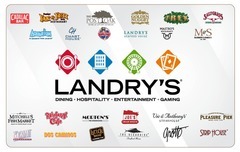 A Landry’s gift card can be used at any of Landry’s 54 restaurant chains. Sell Landry's gift cards on Cardpool.